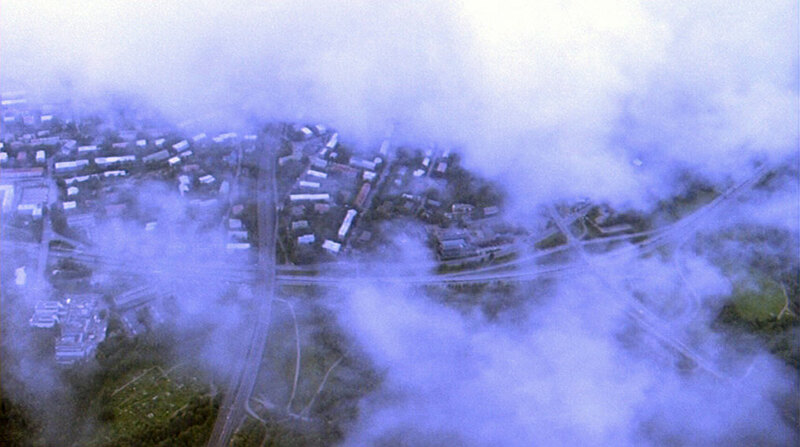 Clean Air (2004) combines aerial views of Helsinki with a soundtrack consisting of recorded breathing sounds of 30 immigrants living in the city. This simple juxtaposition describes the experience of being an outsider. In the summer of 2002 Helsinki advertised itself as the capital with the cleanest air in Europe . This video installation makes an overt reference to this statement, which could also be interpreted as a manifestation of the non-mixed, almost exclusively white, ethnic “purity” of the Finnish territory. The installation includes an audio CD on which these people say their names. The intimacy of breathing and self-identification by saying one’s name accompany the vast city views. These views are open for the all-seeing lens of the camera, yet it is difficult to recognize the landscapes disappearing and reappearing from the clouds. The gaze above the city closes itself into a continuous panning movement. ‘Clean Air’ 2004. Video still. Video installation. S16 mm color film transferred to DVD. Duration 8 minutes. Sound surround 5.1 and audio CD (stereo). Dimensions variable. Sound by Antoine Verhaverbeke. Sound technician Gaetan Lorho.